Monitoring the vitality of cultured living cells is key toward progress in medicine. The effect of new drugs on cellular metabolism and cellular morphology can be investigated. 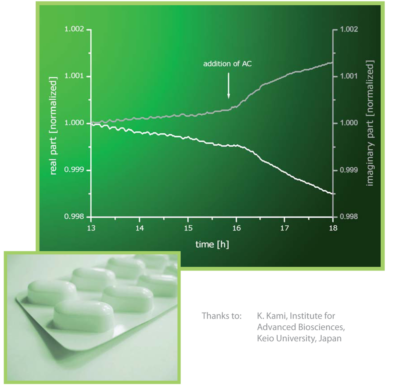 The example shows the influence of the anti cancer drug Arctigenin on a PANC-1 cell line. Both aspects of bioimpedance monitoring (real and imaginary part) are recorded. To test the efficiency of a drug prior to the beginning of a therapy, the drug can be tested on the basis of a patient’s biopsy. 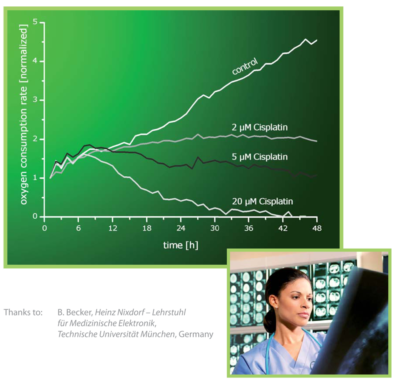 The example shows a dose response curve of the chemotherapeutic agent Cisplatin tested on cancer cells. 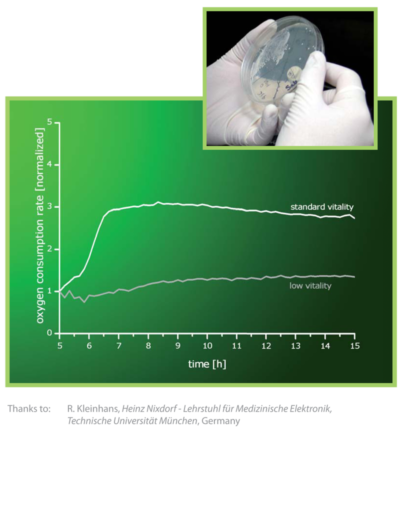 The displayed parameter of cellular vitality is normalized to the time of drug addition. In the field of regenerative medicine the vitality of the used cells can be determined. With the vitality information only the healthiest cells can be selected for e.g. transplantation. The example shows living cells of different vitality status.